A wedding ring can be the most valuable and precious possession in one’s life. It is the visible element that symbolizes the marriage. It is an icon that indicates one’s commitment and loyalty to his/her spouse. Wedding rings are made out of gold, silver, white gold or platinum and are usually worn on the ring finger of the left hand. According to the British tradition, the best man bears the duty of guarding the two wedding rings until the ceremony. The married couple declares their commitment to each other by wearing the ring after the official wedding ceremony. The wedding ring is usually worn on the fourth finger of the left hand since that finger has the ‘vein of love’ which is connected to one’s heart. During the classical period this vein was referred as the vena amoris. The Chinese have given an interesting symbolism for all fingers. According to them the thumb represents one’s parents. The index finger symbolises the siblings. The middle finger represents you. The fourth finger represents your life partner and the fifth represents your children. In some countries such as Colombia, Mexico, Peru, Poland, Germany and Spain the wedding rings are worn on the right hand. In some of the eastern parts of India the wedding rings are worn on toes. Some people who are engaged in industrial work wear the wedding ring in a chain in order to guard it against scrapes and scratches. Wedding rings are usually made with yellow gold which is mixed with copper, tin or silver in order to give it the hardness. Modern wedding rings are mostly made out of platinum or white gold because of their colour and lustre. Titanium is another popular material which is in vogue presently. This metal comes cheaper than gold but of course durable. However due to the low cost some couples settle for wedding rings made out of stainless steel. Although there are elaborate designs, the wedding rings are usually plain bands without any design. 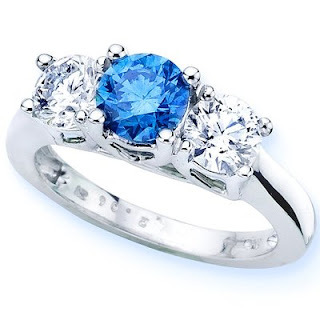 Ladies rings are usually thinner than men’s rings. Three interwoven rings is a popular wedding band design in France. These three rings represent the Christian virtues of love, hope and faith. Some other countries engrave each other’s names to show their bond together. A wedding is a once-in-a lifetime joining of two hearts. Therefore choosing the perfect wedding rings is important since the couple will wear them till death after that special day. Selecting the perfect wedding ring for your partner is not that easy. Therefore both the bride and the groom should select the rings together. Wedding rings can be simple bands, adorned with diamonds or other precious stones and the possibilities are endless. The best option will be to go through an online brochure of a recommended jeweller and select the perfect design that suits each other.